Rule #1 when you live in North Carolina. Never ever plan ANYTHING other than a watching party on ACC Tournament weekend. Guess who broke that rule? Yep, Me! I know this rule, I grew up here. In school, (elementary, junior and senior high) if games came on television during school hours we watched basketball during class. The lure of going to Disney World clouded my judgement because I needed to have a Nutella party before I left. My disastrous scheduling actually led to a very fun afternoon. Since my Nutella party fell flat, I took the party on the road! I put the gift bags in my car, heated up some Nutrigrain Waffles and hit the road. I took the Nutella to a good friend's shop, by my daughter's elementary school and then by my parents house. It was so much fun to let everyone taste the Nutella and get their opinions. I made some interesting discoveries. SEVEN out of ten people I visited had never tasted Nutella. I was very surprised by that because I felt like Nutella had become much more mainstream. Nine out of ten people loved it and planned on using their coupons to buy Nutella. One person noted that a local restaurant uses Nutella as the "sauce" on their dessert pizza! With all of the fresh strawberries around, we have been enjoying them for breakfast along with some Nutella on an English muffin. Yum! I think we have made some new Nutella fans! 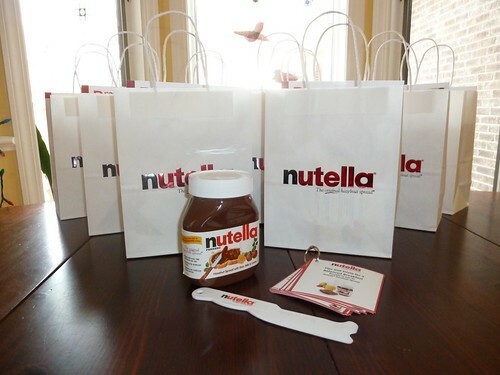 Many Thanks to MommyParties for the opportunity to have a Nutella party! you are making me CRAVE nutella! Best thing I ate in Paris was a crepe with nutella & fresh banana slices. Sooo good!